Eki “Eddie” Fatu died in Houston on Friday after a massive heart attack, adding a long list of professional wrestlers who died by the age of 40. The 36-year old Fatu, who achieved his greatest fame in recent years as a star in the industry-leading World Wrestling Entertainment under the name “Umaga,” was found unconscious in his Spring, TX living room by his wife, who had him rushed to the hospital. Fatu had a second heart attack in the hospital before he died. 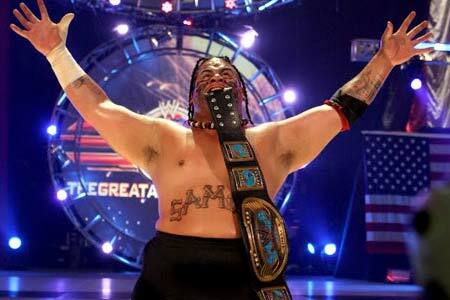 Fatu, who was memorable for his distinct facial tattoos, comes from a large family of Samoan wrestlers who have influenced the business for several generations, beginning with his uncles, the brother combination of Afa and Sika Anoi’a, who formed a successful act known as “The Wild Samoans” in the 1970s and ’80s. The most famous member of the clan is cousin Dwayne “The Rock” Johnson, who left wrestling for Hollywood fame. Fatu’s career peak came in 2007, as he co-headlined Wrestlemania 23 in Detroit, a card that received a ton of publicity for a storyline involving WWE owner Vince McMahon and Donald Trump. But his run at the top was short-lived, and he was released from his WWE contract on June 8 when he refused to go into rehab after a second violation of the WWE’s drug policy. Fatu had recently returned from an independent wrestling tour of Australia when he was stricken. A staggering number of young pro wrestlers have died over the past 10 years, leading some to believe the industry has a curse. Among the most notorious cases were Chris Benoit, 40, who committed suicide in Georgia in 2007 after murdering his wife, Nancy, and son Daniel; Eddie Guerrero, 38, who died of a heart attack in 2005 in a Minnesota hotel room; and Owen Hart, 33, who died in Kansas City in 1999 after a stunt went awry on a live television shoot. In March, another former WWE wrestler, Andrew “Test” Martin, 34, died after an Oxycontin overdose.